Welcome in CSMIT - Panvel. We are showing map for how to reach our college, also we are providing conveyance facility from Panvel Railway Stn. to College. Kindly contact to Mr. Krishna - 8422855504 / 720894049 (Vechile No. MH46-AH-0129). 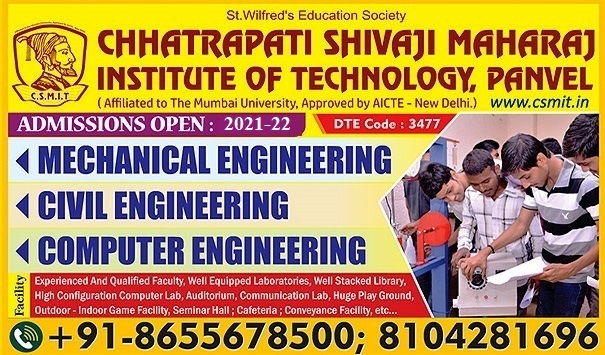 Chhatrapati Shivaji Maharaj Institute of Technology a premier Institute in Mumbai is firmly rooted and has been verdantly bloomed. It adopts an interactive approach in teaching which enhances creative thinking analytical findings and effective communicative skills. Keeping at pace with globalization and resurgence of an open economy, the college tries to equip the students with information and training in entrepreneurship skills and communication. We take pride in being a cohesive group who shares the fundamental aims the staff specializes in excellence and high standard achievers.